Blessed with incredible beaches, crystal-clear waters and one of the most laid-back vibes in the Mediterranean, Formentera is an island of pure bliss. A little over 20km below Ibiza lies the blissful and Bohemian island of Formentera, an unspoilt, peaceful paradise with gorgeous beaches, sparkling waters and charming villages - it is one of the easiest spots to lose yourself in that we know of. Beaches with the whitest sand and waters the clearest and most crystalline you could ever hope for have marked out this island as one of the most idyllic destinations in the Balearics. Many believe that the beaches on Formentera are among the best in the world and when you get there, you will think so too. Off the beaten track and away from the main beaches, you can discover many deserted coves to steal away from any crowds. Formentera is a great destination for when you just want to lie on a beach, eat fine food, drink good wine and sleep long languorous hours. It has attracted everyone from Bob Dylan and Jimi Hendrix to Madonna and Leonardo DiCaprio - all drawn by its incredible peacefulness. You can stay on Formentera for a couple of weeks of deep relaxation or just head over for a day's visit from Ibiza. Whilst you could see the entire island in a day, it's better to take life at the slow pace that is this place's hallmark. Laze on a beach, have lunch in a beachside chiringuito or take a walk around one of its small villages and you will get your island reward of deep peace and a feeling of pure bliss. It is easy to get around the island and on arrival at its port, La Savina, you will be met by various car- and scooter-hire places. Eco options are available with electric vehicles and bicycles available for rent too. Cycling is very popular since the island is small and flat with few steep inclines: it's an activity that fits perfectly with the relaxed way of life on Formentera. 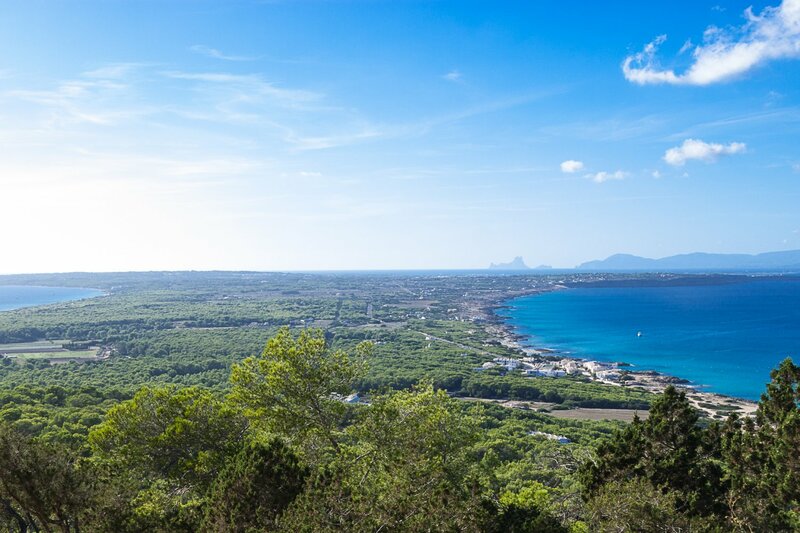 Formentera is a great place to take a walk, either by the coast or inland: you will see some breathtaking views from fields or cliff tops and stand in awe at the beauty you find. Many like to hike to the old lighthouses, some seek out ancient caves and all go to watch the incredible sunset. The sea, with its clear waters is perfect for snorkelling or diving: an amazing kaleidoscope of marine life bursts out just under the surface of the water. The openness of the island means that there a fewer shady spots so it is recommended to protect with a good sunscreen especially at midday. You can expect to return home with a deep golden tan after holidaying on Formentera - as long as you take the right precautions. And there are so much more things to do and see on Formentera, like a day out on a boat or browsing artisan markets - read more in out detailed guide Things to do on Formentera. For a full low-down on travelling around Formentera, check out our guide Getting there and around. Many restaurants and bars abound on Formentera, serving fine and fresh Mediterranean food, often with an Italian twist. There is an interesting mix of rustic meets modern understated luxury in many of these establishments, and most have efficient service. With a long maritime history, expect much fresh fish as well as local products like fresh cheese, dried figs and honey to feature on menus. Those eating establishments next to the sea provide a picture-postcard window on the sea with its hues of azure blue and emerald green. It's possible to find many good restaurants across the island with some great gastronomic offerings everywhere and by the beaches of Ses Illetes and Playa Migjorn. Some of these started off as small beach hut chiringuitos, though today they are thriving centres of fine food. On Formentera you will find a wide selection of low-key hostals and apartments plus charming places in the middle of nature, where you will find absolute peace and tranquillity. The only real holiday resort is Es Pujols, a small village with a beautiful beach and a very relaxed atmosphere. Here, there is a good selection of restaurants, bars and shops and even some good nightlife, where you can dance the night away in some of the popular music bars. The hotels and apartments here are also of a smaller size - mass tourism has no place on Formentera. On the south coast along Playa Migjorn there are some larger hotel complexes which cater for holiday makers which like a bit more of comfort and facilities. The quality and transparency of Formentera's waters is due to the presence of the biggest area of Posidonia seagrass in the Mediterranean Sea that covers the seabed. These underwater grasses are protected by the Ses Salines Nature Park that extends from Ibiza. Ses Salines was once the centre of Formentera's salt industry, which is now no more, but the pretty pink-reflecting salt flats remain. The limited development on the island is what keeps the island unspoilt – on Formentera you won't find any tall buildings, not on the beaches nor in the resorts. A plan to promote more and more electric scooters and cars, even in the public sector and put a brake on cars entering will help to keep Formentera special for tourists. Formentera is 20 km long and only 2 km wide at its smallest expanse with a total land area of 82 square kilometers. It is the smallest and most southerly of the Balearic Islands and is mainly flat rising to its highest point of 193 metres at La Mola. From there, take advantage of the superb vistas you get from the cliffs that plunge down into the sea. Spanish is spoken by everybody as are many European languages by those that work in the tourist trade, the island's biggest employer. The official language is Catalan, a dialect of which called ‘pagès' is mainly spoken by the locals who number just over 12,000 inhabitants. With no airport, Formentera is almost entirely reached by boat from Ibiza. Ferries large and small go there daily year round - though with a reduced service in winter. Ferries run mainly from Ibiza Town, going to Formentera's port of La Savina, but there are also excursions and ferry connections from other resorts on the island. A fast ferry can get you from Ibiza Town in just 30 minutes. See our detailed guide Getting there and around. History of Formentera - For a small island Formentera has a long history. Megalithic graves provide the first evidence of colonisation on the island which can be traced back over 4000 years. Time to hit the streets, cheer on the floats and celebrate.